Late Universe | Explorations in survey cosmology, theoretical physics, signal processing, and Bayesian inference. In a recent paper http://arxiv.org/abs/1409.3571 lead by Jes Ford http://www.phas.ubc.ca/~jesford/Welcome.html the mass-“richness” relation of galaxy clusters was investigating using data from the CFHTLenS survey. A galaxy cluster, is a cluster of galaxies… Galaxies are swarms of stars held together in a common gravitational potential, in an analogous way galaxy clusters are swarms of galaxies held together in a larger gravitational potential structure. The clusters were detected using a 3D matched filter method. This allowed for a very large number of clusters to be found. 18,056 cluster candidates were found in total, which allowed for the statistics of this population of clusters to be measured. chance that we have detected a weak lensing signal behind these clusters and groups! The main result in the paper was the measurement that the mass of clusters increases with the richness with a relation of M200 = M0(N200/20)^β. This may be expected, that clusters that are more massive have more bright galaxies; after all a cluster is defined as a collection of galaxies. We found a normalization M0 ∼ (2.7+0.5) × 10^13 Solar Masses, and a logarithmic slope of β ∼ 1.4 ± 0.1. Curiously no redshift dependence of the normalization was found. This suggests that there is a mechanism that regulates the number of bright galaxies in clusters that is not affected by the evolution of cluster properties over time. We do not know why this relationship should not change over time, or why it has the values it does, but we hope to find out soon. On this blog we have already talked about 3D cosmic shear and the Cosmic Microwave background, this post is about how to combine them. Cosmic shear is the effect where galaxy images, that are (relatively!) near-by – a mere few billion light years – are distorted by gravitational lensing caused by the local matter in the Universe. We can measure this and use the data to learn about how the distribution of matter evolved over that time. The Cosmic Microwave Background (CMB) is the ubiquitous glow of microwaves, that comes from every part of the sky, and that was emitted nearly 14 billion years ago. Analysis of the CMB allows us to learn about the early Universe, but also the nearby Universe because the local matter also gravitationally lenses the microwave photons. In a recent paper we have shown how to combine Cosmic Shear information and CMB together in a single all-encompassing statistic. Because we see the Universe in three dimensions (2 on the sky and one in distance or look-back-time) this new statistic needed to work in three dimensions too. What we found was the when the galaxy and microwave data are combined properly the resulting statistic is more powerful than the sum of the two previous statistics, because there is the extra information that comes from the “cross-correlation” between them. In particular we found that the extra information helps in measuring systematic effects in the cosmic shear data. What is a “cross correlation”? In recent cosmological literature we use this term somewhat colloquially to refer to relationship between data points in a single data set. For example one could correlate the position of galaxies separated by a particular separation – to determine if they were clustered together – or one could correlate the temperature of microwave emission from different parts of the sky (both of these have been done with much success). The word “cross” in “cross correlation” refers to taking correlations of quantities observed from different data sets. The addition of the word “cross” seems somewhat superfluous in fact. If we have experiment A and B one can correlate the data points from A, or correlate data points from B, or correlate data points between A and B. In the new paper we instead used a more descriptive nomenclature that refers to inter and intra datum aspects of the analysis. Intra-datum means using statistics within a single data set and inter-datum means calculating statistics between them; for example the plotting a histogram of points within a data set, compared to plotting the points from two data sets on one graph. Deductive mode. In this approach one has a clearly defined scientific hypothesis, for example the measurement of some parameter (or model) predicted to have a given value(s). Then one can find a statistic that maximises the signal-to-noise (or expected evidence ratio) for that parameter or model. That statistic may or may not include inter-datum aspects. Inductive mode. Alternatively one may simply wish to correlate everything with everything, with no regard to a hypothesis or model. In this approach the motivation would just be to explore the space of possibilities; trying to find something new. If a positive correlation is found then this may, or may not, indicate an underlying physical process or causal relation between the quantities. 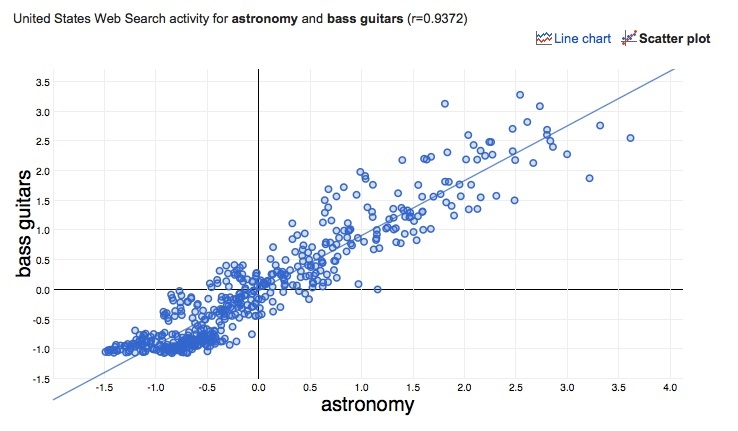 According to Google Correlate searches for “Astronomy” are highly correlated with searches for “Bass Guitar”. In a recent paper, led by collaborator Dr Liping Fu the CFHTLenS survey was used to measure the “3-point correlation function” from weak lensing data. This is one of the first times this has been measured, and certainly one of the clearest detections. 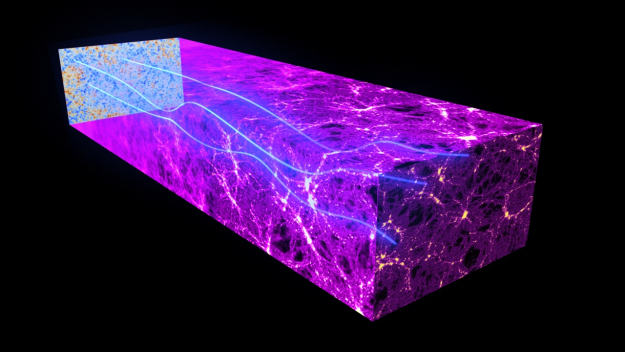 A “2-point” statistic, in cosmology jargon, is one that uses two data points in some way. 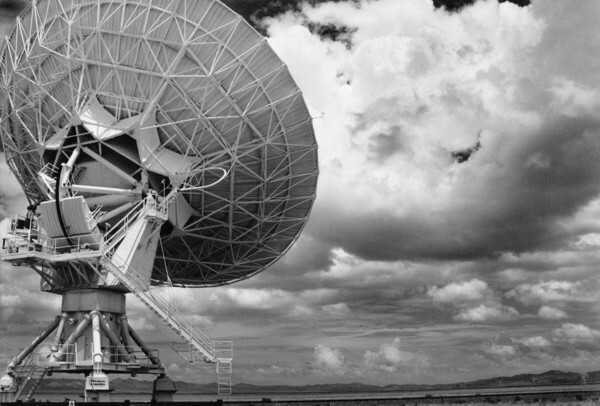 Usually an average over many pairs of objects (galaxies or stars) are used to extract information. In this case what is being measured is called the “two-point [weak lensing] correlation function” and what it measures is the excess probability that any pair of galaxies (separated by a particular angular distance) are aligned. This is slightly different to a similar statistic used in galaxy cluster analysis. The two-point correlation function is related to the Fourier transform of matter power spectrum and can be used to measure cosmological parameters, which is why we are interested in it. In a sense the two-point correlation function is like a scale-dependent measure of the variance of the gravitational lensing in the data: the mean orientation of galaxies is assumed to be zero (when averaged over a large enough number) because there is no preferred direction in the Universe, but the variance is non-zero. The measurement of the 2-point statistic is represented above, “sticks” (of various [angular] lengths) are virtually analysed on the data and the for each stick-length the ellipticity (or “ovalness”) of the galaxies along the direction of the sticks is measured. If the two galaxies are aligned then the multiplication of these ellipticities (e * e) will be positive, but if not then sometimes it will be positive and sometimes negative. Ellipticity can be expressed as two numbers e1 and e2 that lie on a Cartesian graph where positive and negative values represent different alignments. When multiplied together aligned ellipticities therefore produce a positive number and anti-aligned produce a negative number. When averaged over all galaxies a purely random field with no preferred alignment (equal positive and negative) the multiplication averages to zero. If there is alignment the average is positive. Galaxies will align is there is some common material that is causing the gravitational lensing to be coherent. 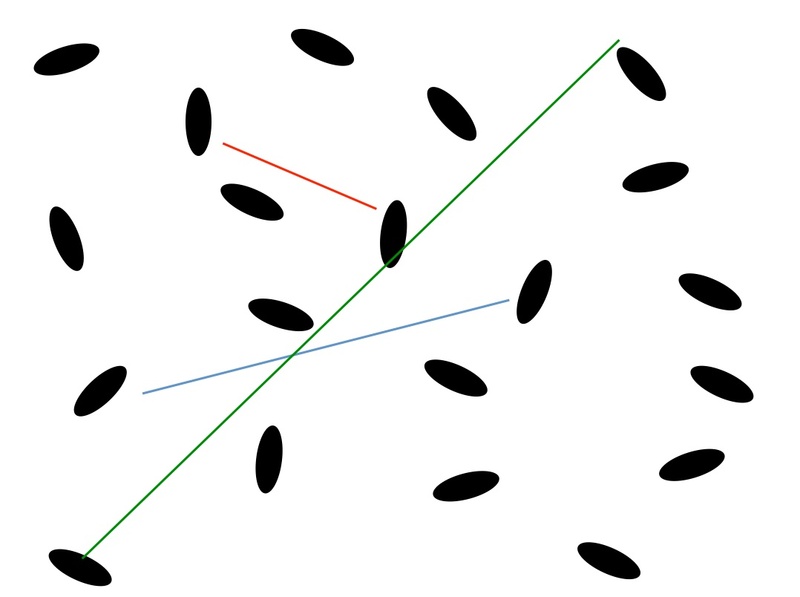 So when averaged over many galaxies the multiplication of the ellipticities <e*e> (the angular brackets represent taking an average) for a particular stick length tells us whether there is lensing material with a scale the same as the sticks length: a positive result means there is alignment on average, a zero result means there is no alignment on average, a negative result would mean there is anti-alignment on average. Figure from Kitching et al. (Annals of Applied Statistics 2011, Vol. 5, No. 3, 2231-2263). 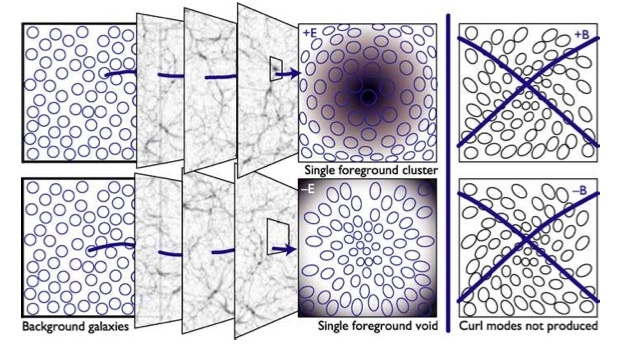 Gravitational lensing from the large scale structure in the universe makes preferred aligned occur around clusters of dark matter of around voids, what we call “E-mode”. Anti-alignment is not normally caused by gravitational lensing, what we call “B-mode”. In this new paper we not only measured the two-point correlation function but also the 3-point correlation function! This is an extension of the idea to now measure the excess probability that any 3 galaxies have preferred alignment. Now instead of a single angle and pairs of galaxies the measurement uses triangle configurations of galaxies and results in a measurement that depends on two angles. This is a much more demanding computational task, because there are many more possible ways that triangle can be drawn than a stick (for every given length of stick the other two sides of the triangle can take many different lengths). The amplitude of the 3-point correlation function tells us if there is any coherent structure on multiple-scales, and in particular allows us to test whether the simple description of large-scale structure using only the 2-point correlation function – and the matter power spectrum – is sufficient or not. This is one of the first measurements of this statistic and paves the way for extracting much more information from lensing data sets than could be done using 2-point statistics alone. 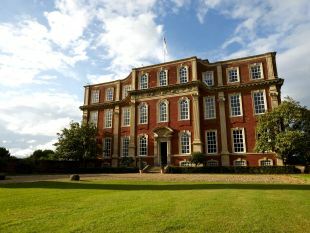 This webpage is dedicated to the organisation of the Science on the Sphere meeting, to be held at the Royal Society Chicheley Hall on 14th and 15th July 2014. Scientific observations are made on spherical geometries in a diverse range of fields, where it is critical to accurately account for the underlying geometry where data live. In cosmology, for example, observations are inherently made on the celestial sphere. If distance information is also available, for example as in galaxy surveys, then the sphere is augmented with the radial line, giving three dimensional data defined on the ball. Future galaxy surveys will provide data of unprecedented detail; to fully exploit such data, three-dimensional analyses that faithfully capture the underlying geometry will be essential to determine the nature of dark energy and dark matter. On stellar scales new experiments are allowing the internal structure of distant stars, and our own Sun, to be analysed for the first time. At home, on Earth, our planet is being imaged and mapped in its entirety; an increasingly important endeavour as we face global challenges. 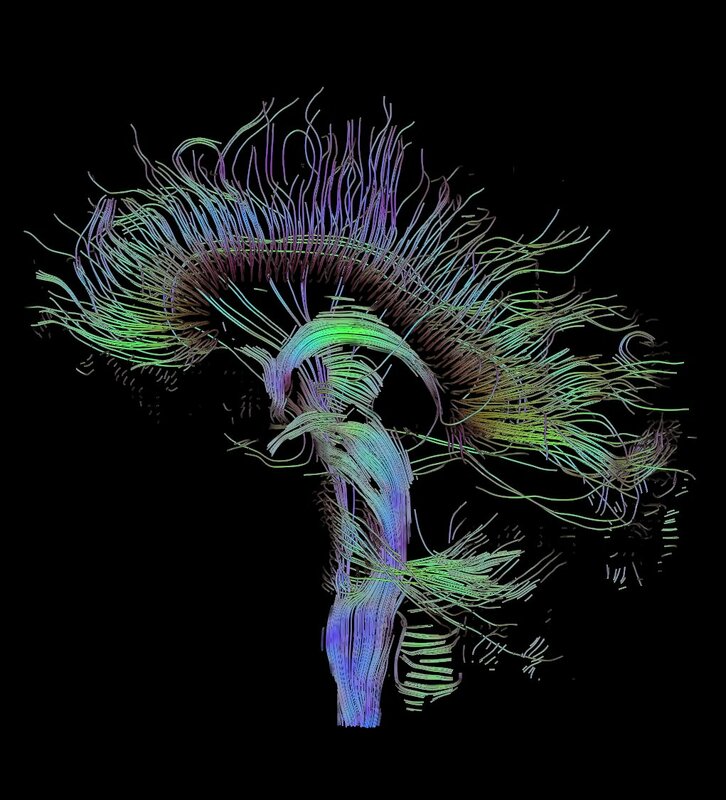 On an individual level medical imaging, and also the computer gaming and special effects industries, require spherical analysis techniques in order develop efficient algorithms. All of these areas share common problems; this seminar series will bring together experts from across these fields to share common solutions and to create new ideas in the collaborative environment of the Royal Society. A diverse range of fields, from cosmology and astronomy, to stellar and geophysics, to medial imaging and computer graphics, share common data analysis challenges. In all of these fields, data are observed on spherical geometries; the subsequent analysis of such data must accurately account for their underlying geometry in order to draw meaningful scientific conclusions. Indeed, the field of principled data analysis on spherical geometries is a field in itself. However, all of these fields are largely disjoint at present. The goal of this multi-disciplinary seminar series is to bring together researchers from these fields in order to address their common data analysis challenges. Seminars will be organized to introduce the assembled experts to new fields, and to the topical spherical data analysis challenges faced in these fields, where it is envisaged that insights from one field will have wide-reaching implications in other fields. By fostering contact between these diverse communities and promoting interdisciplinary collaborations, a coherent and principled approach to the analysis of data observed on spherical geometries will gain wide-spread traction, potentially leading to new and robust scientific findings in a wide range of fields.